Ah, fall semester, so many bad decisions, so many regrets. The beginning of the year was like the beginning of a party, and as you entered the activities fair every club seemed just as promising as every human looks at an Old Kenyon Party. Full “beer-goggles” on, you put your name down for everything. Ducks for the Republicans? Sign me up. Or were you fooled by the condoms and candy the Health Center was giving out? In your excitement to sign up for the Kenyon DJs, did you also not realize your rambunctious friend was also signing you up for Paws against Humanity? Well, regardless you now have more emails in your box than D-Cat himself, and although it’s just February it’s time for some spring-cleaning. Well, it’s November again. Sweaters are no longer optional. Thanksgiving is looming and the campus trees have officially come out to play. Lucky for you all, that means that it’s time for The Thrill to pick up on our exciting feature where we spotlight a dashing yet suave tree that is currently making our walk to Peirce a bit more exciting. 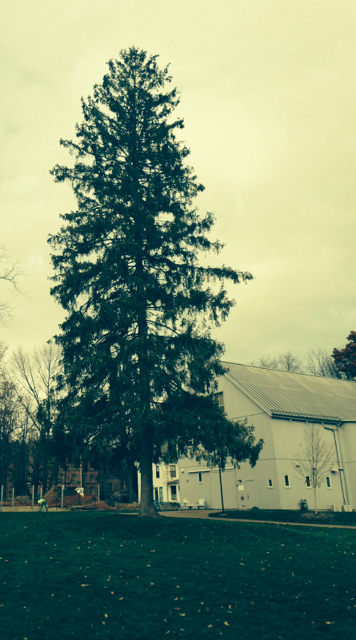 This week we would like to introduce to Tall Green Pine Looking Guy. Get ready to be charmed.